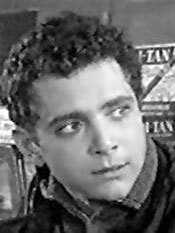 Scott Marlowe became well known for his portrayals of dysfunctional juveniles in several ‘50s films (“Restless Breed”, ‘57; “Cool and the Crazy”, ‘58; “Young and Wild”, ‘58; “Riot In Juvenile Prison”, ‘59 and “The Subterraneans”, ‘60). So when TV westerns of the late ‘50s and early ‘60s needed an intense James Dean type for their story it was often Scott Marlowe to whom they turned. and the Kid from Nowhere”, “Law of the Plainsman: Show-Off” (an imitation Billy the Kid), “Have Gun Will Travel: Duke of Texas” (as a spoiled young prince) and “Hanging of Roy Carter” (a kid about to be hung), “Wagon Train: Gabe Carswell Story” (as a bitter young half-Indian who hates all white men), and so many others on “Gunsmoke”, “Zane Grey Theatre”, “Stoney Burke”, “Bonanza”, “Rawhide”, “Lancer” and “Cade’s County”. 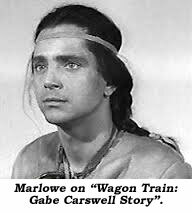 Marlowe, born June 24, 1932, in L.A., was a well-behaved child, good at academic studies, but when he started to find his way into film work it was the Hollywood studios that saw him as a “rebel” and told him to drop his nice guy image. 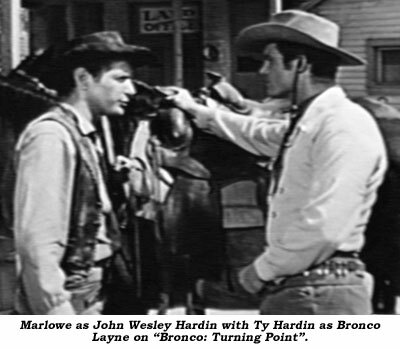 After working in local theatre productions Marlowe fell into his first movie while visiting a friend who was working at 20th Century Fox. The director of “Attila” (‘54) spotted him on the lot and asked if he wanted a bit in the film. From then on, through 1999, Marlowe was seldom out of work. His motto was, “It’s better to be seen in something than not to be seen at all.” If he wasn’t in a film, he was working live theatre across the U.S., including a fine performance in “Death of a Salesman” at Chicago’s Civic Theatre. At only 68, Marlowe died in L.A. January 6, 2001, of a heart attack.